The ground-breaking ceremony for the 2nd construction phase of Brenntenberg II windfarm in the district of Dinau is scheduled for March. The 2nd construction phase consists of 2 wind turbines with a rated power of 4.6 MW: the project planning, design and implementation are being carried out by Green Energy 3000 GmbH. Both turbines will be offered for direct acquisition, including all rights. The 2 wind turbines to be installed are type E-82 E2 (138m hub height), made by Germany's largest wind turbine manufacturer ENERCON. With a forecast annual yield of around 8.2 million kWh, in future around 3,300 households will be supplied with green electricity. Following intensive preliminary work, the designers opted for ENERCON wind turbines with a hub height of 138 metres each to utilise the wind conditions on site optimally. The wind turbines will be erected in the district of Dinau, near Nassenau, directly on the boundary with Markt Hohenfels and Markt Beratzhausen, across whose Oberpfraundorf, Markstetten and Raitenbuch districts the cable to the Hausraitenbuch transformer station runs. Following completion of the road construction work, foundation work and construction of the crane standing area, assembly of the two wind turbines will begin in July, so that commissioning can be scheduled for October 2015. The whole construction phase is being secured through close collaboration with regional contractors. 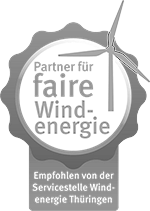 The date is realistic says Andreas Renker, Managing Director of Green Energy 3000 GmbH. "For many years we have had partners at our side with whom we have already completed many of our projects successfully". "We are pleased that the construction work can be started so quickly" explains Dirk Malczyk, site engineer of Green Energy 3000 GmbH. "The local district administrative office, Landratsamt Regensburg, and all the public agencies involved have supported our project fully and followed it favourably along each step of the way." What will our energy supply be like in the future? Clean, reliable and affordable, so that the worldwide energy supply can be switched over to renewable energy only in the foreseeable future. The extension of the windfarm is largely accepted by the local population and we are certain that with this project we are making another important contribution to Germany's "Energiewende" or energy policy turnaround.